Forays of a Finance Foodie: The Redeye Grill: Great Steaks, Service And Sensational Sweets! The Redeye Grill: Great Steaks, Service And Sensational Sweets! 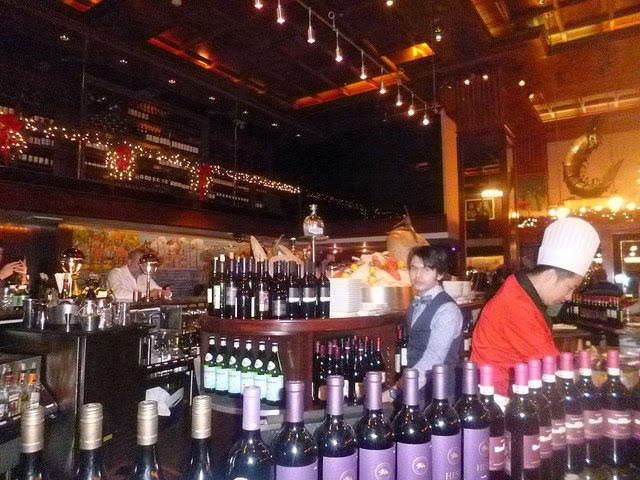 My recent trip to Redeye Grill, the long-standing and chic eatery at the corner of 56th and Seventh, only proved the old staying that “some things, like fine wine, get better with age.” I have been here about six times in the past 15-20 years, starting with a press luncheon for P. Diddy given by Universal Music back when the record companies still had money to burn and digital downloads hadn’t taken over yet. The décor is a mélange of different looks—I would say it’s a classic New York Steakhouse meets Soho Loft Living with a touch of Old Hollywood added in for good measure. There are high ceilings with massive saloon style chandeliers and what seems to be enough seating for about 200 guests, plus private dining rooms. You see a lot of people celebrating milestone events in their lives here, so it’s a “special place” where the prices are not cheap—but you get quality AND quantity. 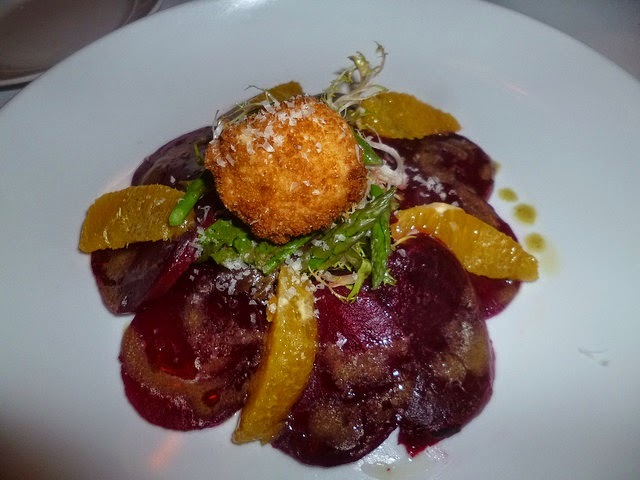 We started out with glasses of Prosecco and a wonderful Roasted Beet Salad ($14) that was a special that night (I am sure you can request it on nights it is not on the menu). It was locally grown golden and red beets gently roasted with frisee on top. It tasted so fresh that I told myself I would come back on a “diet day” and order just that one item. Let me add there is an assortment of interesting bread brought around by a wait staff member that includes wonderful Pretzel Bread that is so moist, it does not need butter or olive oil. The “bread guy” comes around about four times so that you can try everything in his basket or get seconds on the breads that you prefer. 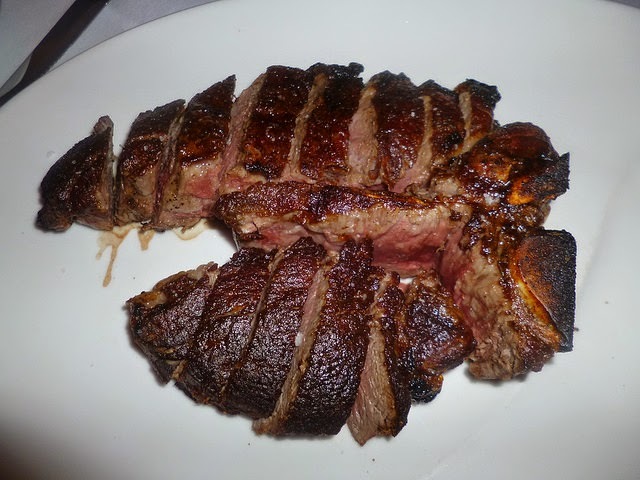 My goal on my visit there last week was to check out the wonderful steak assortment. You can get almost any prime cut except for prime rib and the most popular are Filet Mignon, Porterhouse, Ribeye and New York Strip. My dining partner and I choose the 26-ounce Porterhouse For 2 ($49). It was very reminiscent of the famous Porterhouse served at Peter Luger’s but without the buttery sauce that accompanies it. We ordered Peppercorn and Béarnaise Sauces on the side for an additional three dollars each that were well worth it—they were done in the traditional French recipes and knocked our Spanx off! The sides that we shared were a wonderful and unique cauliflower dish that would be perfect for low card dieters but delicious enough for non-Dr. Atkins fans to love—a whole head of cauliflower with a wonderful cheesy cream sauce poured over it. 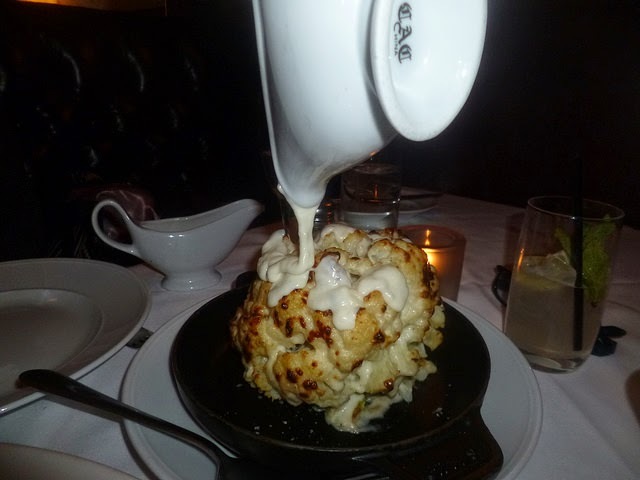 Just say you want the “Cauliflower Special” ($14). The sauce tasted like it was made with fresh white cheddar and was poured at the table, which was a classy touch. We also ordered Hand-Cut French Fries With Herbs that were fried in canola oil to a perfect golden color. I love the liberally sprinkling of fresh rosemary on top. For dessert, the Redeye Grill is famous for it’s Banana Cream Pie ($14). It is considered the best in the city and there is good reason why—there are real slices of banana and rich vanilla custard in the filling and the crust is rich and flakey. It doesn’t hurt that there is about four inches of fresh whipped cream on top and that the portion is big enough for three people, either. Gail and I not only indulged in the Banana Cream Pie but in the Strawberry Cheesecake ($14) as well. A warm Hershey’s chocolate sauce you could pour on yourself accompanied it, but I preferred the cheesecake by itself. The strawberries were sweet and juicy, the whipped cream had a strong vanilla accent and the filling was creamy and smooth. The chocolate shavings on top were the perfect finishing touch. If you don’t want to order dessert, you will still get a dish of hot homemade chocolate chip cookies as a free bonus—and they are as warm and chewy as you can imagine in your wildest childhood dreams! I will definitely be back at Ribeye Grill to try more cuts of steak (including the ribeye, naturally) and some of my friends want to join me to check out Redeye Grill’s extensive list of fresh seafood--especially their much-heralded oyster selection. Many of my foodie friends have raved about the stone and king crabs. I am more of a landlubber, but there is something to please everyone at this beloved longstanding Midtown West eatery!